I know you’re having a hard time this summer, what with three-hour lines at security and dealing with unhappy, cramped travelers. I hate to burden you with another complaint, but really, can’t you do just a few small things to make life easier for travelers with hearing loss? I hope you realize that we represent 1 in 5 of your customers. Of the 50 million Americans with hearing loss, quite a few end up on your airplanes. I’m the first to agree that it is our own responsibility to notify everyone about our hearing loss and our needs and to prepare extra carefully for any trip. I made suggestions for hard-of-hearing passengers in a post earlier this year. But airlines, you need to do a better job. And you can! None of my suggestions are particularly difficult to implement. Airlines like Emirates, with passengers speaking many languages, have been doing it for years. The correct disability service. When we reserve online, there is a space to note a disability and the kinds of services offered. Why, then, is someone who checks “Deaf and Hard of Hearing” offered a wheelchair? This has happened repeatedly to my hard-of-hearing friends. I also have deaf friends who have been offered Braille options. Please ask us to specify what services we need. How about someone to transcribe information? A sign language interpreter? 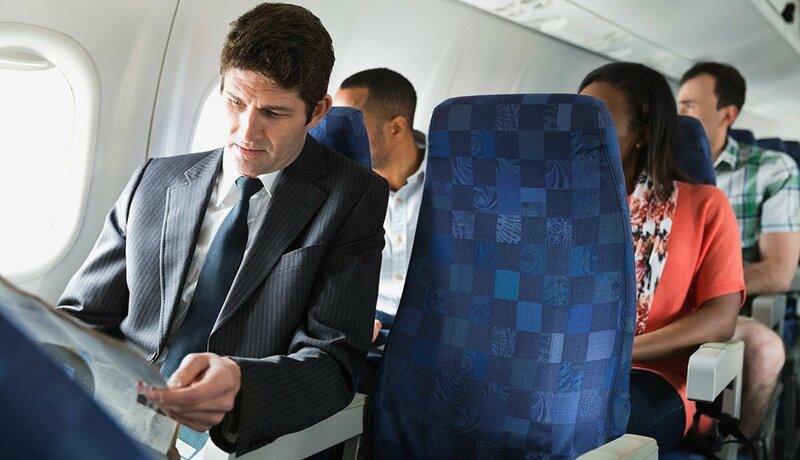 Even assurance that a flight attendant will make a special effort to tell us anything we need to know about what’s going on? Better phone reservations. Most of us with hearing loss are pretty adept at computers. It’s the easiest way to communicate. But sometimes a phone call can’t be avoided, and an agent with a heavy accent can make information even harder for us to understand. Please politely allow us to be transferred to an agent who speaks English clearly. Captioned safety announcements. Delta, you’ve come a long way toward helping those of us with hearing loss with your captioned safety videos. They’re even funny, so they hold our attention. But midair, when the pilot comes on and says something over the speaker, unfortunately, it sounds like just one long incomprehensible garble. It could be anything from, “Hello, folks, we’re turning off the seat-belt sign now,” to, “Hello, folks, we’re about to encounter some turbulence that may knock you off your feet, so be sure to sit down and buckle your seat belt.” Why not live-caption this information on the screens right in front of our eyes? Voice recognition software is getting better and better. Pre-boarding the plane. Lots of progress here with new electronic displays that tell you what zone is boarding, as well as information about upgrades and standby status, so the hard-of-hearing passenger isn’t left in total confusion. In the past I’d often been brushed off by a gate attendant and told to go take my seat until my zone was called. (This is against the rules, by the way. Under the Air Carrier Access Act (ACAA), when someone identifies himself as a person with a hearing loss, the gate attendant must provide equal access to the boarding announcements, even if that means coming over to where the passenger is sitting to repeat the announcement.) More experienced now, I tell the gate attendants before boarding starts that I’m hard of hearing and won’t hear the zones. They often offer me pre-boarding, which also means that I’m not battling for overhead bin space. Menus for food service. When food service starts, have the attendant bring along a menu that describes our choices. Don’t just say “Chicken or pasta?” Some of us avoid certain ingredients, so it’s really helpful to know if there are allergens like nuts or dairy. I’d much rather find this out before it’s on my tray than after. It’s wasteful, as well. I know I can ask for a special menu, but I usually forget. Captioned movies. Increasingly, some are captioned, even ones in English. Thank you for that. But they all should be. In case you’re not willing to do this voluntarily, the U.S. Transportation Department (DOT) may soon be stepping in. This week the Hearing Loss Association of America (HLAA) announced that the DOT had invited Lise Hamlin of HLAA to be part of an advisory committee on accessible transportation, which is considering changes to in-flight entertainment and communication, as well as rules about service animals and accessible lavatories. In an announcement to members, HLAA noted that the path may be rocky. “We apparently have our work cut out for us,” the group said, referring to challenges from the airline industry over DOT’s authority to make these changes. Consumers, it’s your turn. The HLAA advises, “If you fly this summer and don’t get the access you need, please file a complaint.” The association also suggests letting Lise Hamlin (advocacy@hearingloss.org) know about the problem. This article first appeared on AARP Health on May 27, 2016. Great blog, Katherine. The way deaf and hard of hearing people are treated by the airlines is so indicative of our society’s general ignorance of this widespread disability — even though we’ve been granted rights under the Americans With Disability Act and other laws for a quarter century. C’mon people. Nobody will listen un;less we speak up! Until people with disabilities are willing to star filing ADA lawsuits it won’t improve. We’ve had ADA for 26 years. Time to start taking these companies down by their wallets!